Harm reduction is most often used in reference to addictions. The idea is to accept that the user is continuing to use because that is what’s currently most able to meet their needs, and then identify ways in which they can do so that minimizes associated harms. Harm reduction is a widely accepted public health approach, and in addiction can include safer smoking/injecting supplies, opioid substitution therapy like methadone, and supervised consumption sites. The concept of harm reduction is also applicable to self-harm. Harm reduction strategies can decrease associated complications while ideally working on the underlying problems that contribute to the self-harm behaviour. A journal article I found on self-harm said that while harm reduction is a beneficial approach, service providers may be reluctant to embrace it because they don’t want to come across as encouraging self-harm or giving people ideas about the most dangerous places to cut themselves. The thing is, though, those ideas are already there well before the health care provider starts talking about them. In my work as a nurse I’ve done some harm reduction teaching before with clients who self-harm, and it seemed like a way to acknowledge and accept their reality and their struggles. The National Self-Harm Network publishes a guide called Cutting the Risk: Self-Harm, Self-Care and Risk Reduction. The guide covers anatomy, including the locations of major veins and arteries and different types of tissue, including the consequences of cutting through each type. It is not sensationalistic about this, but rather very matter-of-fact. Other topics include wound care, infection prevention, ways to manage bleeding, caring for burns, and advice on when to seek medical help. The guide recommends first aid supplies to have on hand. The National Self-Harm Network also has a Harm Yourself Less Workbook that is written by people who self-harm. It asks a lot of reflective questions to help people explore all aspects of their self-harming experience. This can be used as a personal learning and growth tool, or it can be worked on with a therapist to enhance the impact. For harm reduction to happen, the first step is that we need to actually talk about self-harm. There is so much stigma around it, and it tends to dwell in the shadows because many people don’t understand it and aren’t willing to hear about it. And of course if people aren’t willing to hear about it, then it’s pretty hard for anyone to talk about it in a constructive way. In the spirit of talking about it, I’ll share my own, albeit limited, experience. I went through a phase of self-harm during my first episode of depression over 10 years ago. It began when I was in hospital, and wanted to distract myself from distressing thoughts, particularly thoughts of suicide. I didn’t have access to much on the ward, so I would use staples that I picked off a bulletin board. I used the staples to scrape lines across my skin. I figured out that if I did it close to joints, especially my shoulders, I would get a distracting twinge of pain every time I moved. It was certainly a maladaptive behaviour, but in the moment it was effective. I continued the self-harm for a few weeks after discharge, but as the depression improved, the suicidal thoughts decreased, and I no longer felt the need to self-harm in order to cope. It wasn’t something that ever made a reappearance in subsequent episodes of depression. I think there was only ever one person I ever told about my self-harm. I disclosed it to a coworker/friend that I was close to and who already knew about my depression. We’d been talking about a client self-harming. For whatever reason I decided to bring up my own experience with it, and he quickly cut me off, saying he didn’t want to hear that from me. Um, okay. Silence is not a good thing when it comes to mental health. Self-harm happens. Even if people don’t like it, it’s reality. It’s a reality that needs to be talked about rather than buried under a layer of fear. Addressing self-harm is complicated and multi-faceted, and harm reduction can be one way to help keep people safer while getting at the core issues. Is self-harm something you’ve struggled with? 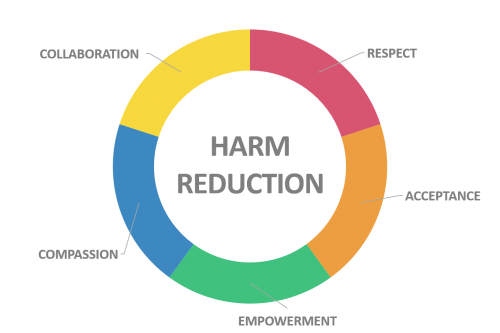 Have you incorporated harm reduction strategies? Originally published at mentalhealthathome.org on March 28, 2019. We don't talk enough about mental health.